A SMALL GESTURE MAKES A BIG DIFFERENCE! 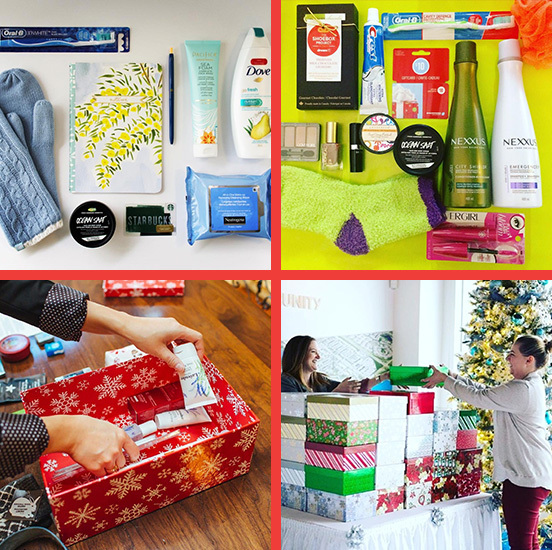 Join us in helping women living in shelters by supporting the Shoebox Project,.an initiative that asks people to fill a shoebox with little luxuries up to a maximum of $50 that are delivered to women experiencing homelessness in our community. You can drop off your shoebox at any Tamarack Sales Centre, Design Centre, and our Head Office November 1st – December 3rd. Please use a dollar store purchased Shoebox or one you have at home, NOT over sized boot boxes or child-sized boxes. We want everyone to receive a gift similar in size and value. Remember, these are often opened at holiday parties so each woman will see the other woman's Shoebox. As well, the standard size makes for easy stacking and delivery. The Shoebox (if you are wrapping a Shoebox you have at home) is wrapped properly, not sealed and has no bow or big ornament on top. Decorations on the lid make it really hard to stack the Shoeboxes and we typically have to discard these items. And we don't want any waste, for obvious reasons. Wrap the top and bottom of the Shoebox separately, using good quality paper. If you have trouble, watch a tutorial. Consider lining your Shoebox with tissue paper first for a more polished, elegant look. Tie a ribbon around the Shoebox as we will have to undo it during our quality check. We can never recreate your beauty. Put a large ribbon or ornament on the top of the Shoebox or use delicate ribbons. Our Shoeboxes are stacked on top of one another and undergo some degree of wear and tear during transport. Tip: Shoeboxes that come in two pieces are much easier to wrap than the one piece boxes with lids that fold over. The contents of the Shoebox must be valued at $50. Not more. Not less. are often opened at group parties. Each woman should receive the same look and feel. Very important for self-worth etc. that come to us on the skinny side or overflowing, meaning we need to do a major edit. Robbing Peter to pay Paul, if you will. Given we have thousands of Shoeboxes to edit, it is always ideal to have them come to us as they should be. Do not overstuff your box. Make sure the lid fits on properly and doesn’t pop off. Avoid including items that are overly delicate to avoid anything getting broken in transit. Tip: The high quality of our gifts is an important element that sets The Shoebox Project apart from other donations the shelters receive throughout the year. Select only items that you would like to receive as a gift or items that you might purchase for a relative or a close friend! Mascara, nail polish, lip stick, lip gloss, eye shadow or blush. Please avoid concealers and foundations as we all have very different skin tones. If you give nail polish, please consider including a travel-size nail file, nail polish remover, cotton pads or cotton balls. A small one is great so you can pop your 'something pretty' item into it. Putting the items into the cosmetic bag also makes opening up the Shoebox even more fun for the recipient. Ideally try to find items that are cozy, but not too bulky. A large toque or scarf can really take up a lot of room in the Shoebox. As well, the women may not have a lot of space at the shelter etc., so it is always good to keep that in mind. We like the idea of a good pair of socks or even the Joe Fresh moisturizing gloves. You can slather on the La Roche Posay baume and then put on the mittens or socks. Very nourishing. Gift card (Please write the amount on the card or include the receipt). We provide Shoeboxes to many family shelters. The mothers will focus on getting a gift for their children/local charities give the children gifts, but the mothers often go without anything. In shelters for women who are victims of violence, it takes a lot of theray to restore their self-confidence, and reduce their fears of going out. The gift card can be used to buy make-up they might want after a make-up lesson (All done to work on self-esteem). At the Glebe Shoppers they sell the Joe Fresh accessories line. They have gorgeous cubic zirconia earrings that are always a classic piece to have. Shampoo and conditioner, body wash, face wipes/make-up removers, brush/comb. Ideally choose the travel-size versions of shampoo, conditioner etc. This helps ensure you have lots of room for other items. As well, the women may only have a small bathroom kit or small space to store the items. Include as a gift a toiletries bag. They sell three together at Shoppers: Use large for the travel-sized personal items, and the other two for your 'pretty,' 'soothing,' or other items) is also a much-loved find in the Shoeboxes. Colouring book, coloured pencils, blank journal, playing cards, etc. Bus tickets, sunscreen, hair ties, purse-sized packets of Kleenex. For example, the travel-size La Roche Posay Baume, lip balm at Shoppers. They are $9.99 and perfect products for winter, as well as for our shelters that are scent-free, super-sensitive skin and work for everyone. Used goods and hotel sample size body products are not the right Shoebox gift items to make someone feel special. However, your local shelter would be pleased to receive these items directly from you throughout the year. Bubble bath or bath bombs are not useful for shelter clients. However, body wash for the shower is a great gift. Foundations or concealers should not be included because each person has a unique skin tone. Anything opened or not packaged. A warm, supportive greeting can be extremely meaningful for a woman during an otherwise lonely time.